In addition to soccer (for Rachel and Benjamin) and organ (for Miriam) and statistics (for Andrew), we also had to squeeze in parent/teacher conferences as well. Because Rachel's soccer game was in the evening, I went ahead and signed up to visit with her teacher right after school. By the time I got to the sign up sheets for Miriam and Benjamin's class, however, only evening slots were left so I signed up for evening slots (which was just as well, I suppose since Miriam had to leave right after school for her organ class). The little kids and I met the big kids after school (stopping on our way to visit with Daddy, who had come to pick Miriam up from school so he could take her to campus) and had a lovely visit with Rachel's teacher. She's doing well, is always on task (her teacher couldn't believe that I ever have to tell her to stop reading at home because she never reads when she shouldn't at school), completes her work and helps others complete their work. Her only complaint is that Rachel writes using such a tiny font size that she almost needs a magnifying glass to read her work. When she tried out for the musical last she was thrilled to get a part in the company. She wasn't remotely upset that she didn't get a speaking part, was proud of her friends who did get speaking parts, and threw herself into being a good company member. She picked the viola for orchestra because "everyone chooses the violin (because they get the good parts), but the viola is a good instrument, too." Also, she didn't want to lug a cello around. In soccer she usually plays midfield. Her coach likes to keep her there because she's more likely to pass the ball (so can assist with getting goals, rather than always trying to be in the spotlight). In choir, she's happy to sing whatever needs to be sung. She's in the soprano section for both ward and stake choir and she's doing great! I'm an alto in our ward choir (usually; I bounce around a bit) and a soprano in the stake choir. When our stake chorister asked for a few people to hit "the high note" of the song only a few women volunteered, which was perfect because she only wanted a few women to hit the note. Rachel happily learned the part for second soprano, which is no small thing (apparently) because there were tears last week when a few young girls in the choir learned that they had been "demoted" to second sopranos. And that's just Rachel. She knows you can't be demoted to second soprano because she knows all the notes are important. When I was her age I was not so mature and always wanted to be first soprano (the best!) but I've since learned that I enjoy the harmonies (and know that all parts are the best). Rachel seemed to just know that naturally. She's a team player—my capable, realistic, amazing girl! One more example, really quick, is that when she ran for student council she didn't want to be a class representative. She wanted to be a service or technology leader. Unfortunately for her, she was selected to be a class representative which does put her in the spotlight a lot more than she'd like (she has to do morning announcements and go to all sorts of meetings and things) but she's rolling with that, too! She's accepted her position and is doing her best to fulfill her responsibilities. We met with Benjamin and Miriam's teachers after Benjamin's soccer game (and after Naanii dropped Miriam off after organ). Miriam's teacher says, "Miriam is such a model student. I love having her in class. She is very bright and excels in all the things she has tried. I love her ambition for learning. I love having Miriam in class." She has such fun homework this year that we're enjoying doing together. Her teacher assigns the students a household chore to try each week (so far: sweeping, dusting, and making their beds), a family activity to do (such as going for a walk or playing a board game), and a monthly family project. This month she had to make a timeline of her life and we had a great time going through old pictures and blog posts to piece together all her milestones. Most of Miriam's friends wound up in other classes this year, which was a little perplexing at first. But Miriam came home beaming a little while ago and announced, "I finally have a group of friends!" She still plays with her group of friends during recess, but has branched out to include some girls from her class as well. I'm glad she's found some good kids to play with! She's been enjoying her extracurriculars, organ and piano, this year, as well as attending the teacher training inservice that Naanii is doing this semester. The teacher for that class contacted Andrew in order to rave about Miriam (Andrew went through that inservice last year and the teacher recognized our last name). She said that Miriam "truly is something else, so far beyond the average nine-year-old, intellectually and socially. Congratulations are in order to you and your wife!" I don't include that praise as a brag, necessarily (though what is a blog if not one big brag? ), but so that I can look back at it when we experience parenting lows (somehow we keep finding new ones). Miriam's school teacher also had her choose something to work on for the next quarter and was shocked to see that Miriam had written down: respect myself. She felt like she needed to talk to Miriam about that and discovered that Miriam has plenty of respect for herself but tends to be a bit of a perfectionist. When she does something wrong she really beats herself up about it. And that's true! I have to be very careful about getting after Miriam because she will (figuratively) flog herself afterwards (which I've explained to her many times isn't necessary). 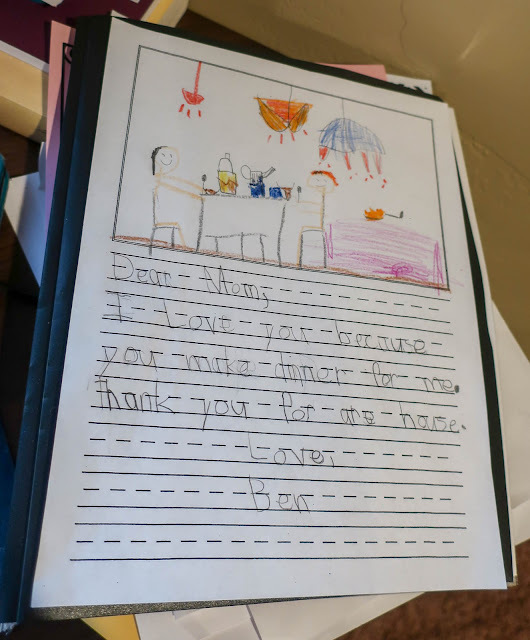 Her teacher rephrased her goal to be "not being too hard on herself," but I think I would rephrase it to be, "accepting her best work as her best work." Falling short sometimes is okay, as long as you made an honest effort, and mistakes are important learning opportunities. Learning that would be beneficial for Miriam, who almost always give her best effort (and even then will sometimes have to keep a piano song for more than one week before she's mastered it (which is very frustrating for her because she feels that if she practices every day she should have anything mastered within a week)). She's a very eager-to-please, this musically-minded, bright, empathetic child of mine. I found this written on the whiteboard in Miriam's bedroom when I went to put Alexander down for his nap. She's pretty wonderful. Benjamin's teacher also had nothing but praise. He's always on task, always finishes his work, is kind and polite, respectful to both his peers and teachers. He's well above his reading level and started a math enrichment program because he needed something a little more challenging. He's loving and helpful and all around a joy to have in the classroom. I kind of blinked a bit and floundered for what to say because it was a bit of a shock. Are we even talking about the same child?! He definitely suffers from "after school restraint collapse," a relatively new-ish term for a relatively ancient problem. 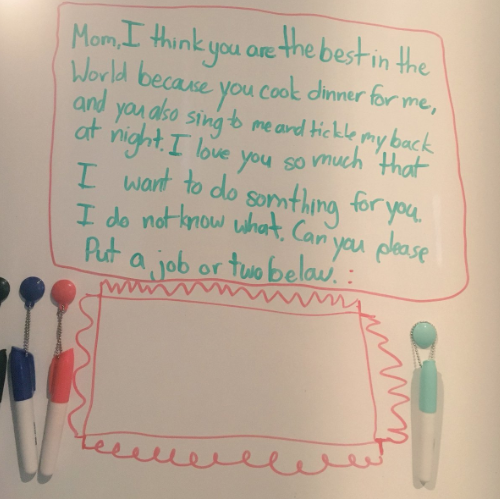 Rachel certainly suffered from this as well (she would have hours-long tantrums every day after kindergarten for the first little while; it was awful). My mom remembers having this issue as well—being so careful and so good at school and then exploding all over the place once she got home. Benjamin doesn't throw tantrums, however. He's never been very big on tantrums. Instead he just goes wild. He unleashes all the energy he's been suppressing all day long and starts (almost literally) bouncing off the wall. He talks—loudly—and gallops around the house—loudly—and messily munches a snack—loudly—and then runs around yelling and screaming while letting his arms flail about. It's mind-boggling how much noise and movement he needs to make after he gets home from school. And he gets three recesses a day (which is pretty good, in my opinion)! But he's a good kid, really truly and I love him from the tips of his constantly wiggling toes to his messy bedhead hair. I was so happy to hear that he's doing well—flourishing even—with all the pressures of grade one (which is a big step up from kindergarten). His writing has already improved leaps and bounds this year, his drawings are getting so detailed, he's finally excited about reading Magic Treehouse books on his own (he loves taking the quizzes online when he's finished) and we're close to finishing up reading Harry Potter and The Prisoner of Azkaban together (and he's looking forward to starting book four). He's pretty good at doing his chores and is learning a lot of independence. I've only caught him with his pants on backwards a couple of times so far this school year, so he's making big improvements all around! I sure do love my little ball of energy, my clever, charming boy. How delightful! It feels so good to have great reports at parent/teacher conferences. Which of my children wrote so tiny that you needed a magnifying glass? I think more than one. Abra? David? you? I know it wasn't Kelli, and I don't think it was Patrick. Josie? Well, someone did.